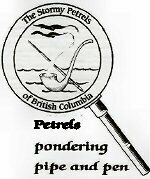 The next meeting of The Stormy Petrels will take place 7:00pm, April 7th. This account was penned in the third person. Who do you think wrote it? Why? Do you believe ‘Martha’ was Mrs. Hudson? Why or why not. And, if ‘Martha’ was Mrs. Hudson, wouldn’t Watson have registered some surprise at seeing her? Why did the British Government all this story to be published in 1917 while the war was still in progress? Why would there be a pigeon-hole marked “Fords”? Who do you think were the “Window-breaking Furies”? Do you think the English are a “…docile, simple folk…”? What do you think made von Bork think this way? All canonical illustrations aside, who do you think chloroformed von Bork? With von Bork’s arms and legs bound to his sides, how was he able to clutch at his throat or be walked out to the car? Holmes suggested that von Bork might be released after his visit to Schotland Yard. Does this make sense in light of all that Holmes had done to pass false information through von Bork? Would von Bork’s capture not arouse suspicion that the information which passed through him was untrustworthy? Would there have been some other way for Holmes to get at von Bork’s papers without tipping off the Germans that the game was up? Why was he not arrested for espionage? He was not named as an official member of the German legislation, or else his motives for being in England for four years would have come under suspicion. What do you believe was von Bork’s ultimate fate? Don’t forget the “Master’s Dinner” on Saturday, March 21, 2009!